EPBD REVIEW: are we all ready to take the next step? This month can set a new milestone for all building stakeholders provided that the EPBD - Energy Performance Buildings Directive Review has a positive outcome. ITRE, The Committee on Industry, Research and Energy Members of Parliament adopted end of October a report on the EU Commission’s original proposal. In this amended proposal more ambitious amendments are included in order to reach the targets on energy savings and CO2 reduction for buildings beyond 2020. Now trilogue institutional negotiations (EU Commission – EP (represented by ITRE) and EU Council ) are on-going targeting to land with an agreement on the adapted EPB legislative proposal, hopefully by end of December under Estonian Presidency. ITRE also increased the ambition in adopting an amended Energy Efficiency Directive report going for a 40% national energy efficiency target by 2030, with national binding targets and strong provisions on energy savings obligations. For renewable energy the target has been set on 35% by 2030. Both targets go beyond the envisaged 27% of the EU Commission but are very logic considering the pathway towards a carbon neutral society. What are the headlines of the current EPBD legislative proposal? The proposal is strongly connected to the Energy Union’s commitment for a decarbonised society by 2050. Member states will have to set a long term renovation strategy with clear intermediate milestones for the building stock that also needs to become NZEB (nearly zero energy). Buildings will be prepared to become part of the smart energy grid with connection to e-mobility. The proposal also adds a social dimension. Health of people living and working in buildings has been added to the energy efficiency and CO2 targets. Technical building systems, among which solar shading serve to provide an energy efficient indoor climate with positive impact on health, well-being, comfort and productivity. A smartness indicator in coherence with energy performance certificate will support end-users to measure buildings in optimizing its operation, performance, indoor comfort and to interact with the grid. Equally important is energy poverty. Rightly so, people should not have to choose between eating or heating, nor cooling. Therefore member states will have to introduce policies to support households subject to energy poverty. ES-SO welcomes strongly the efforts and the ambition of ITRE MEP’s supported by the EU Commission in strengthening the legislative work. All eyes are set now on the Member States in taking up their responsibility to reach an agreement. There is no way back, neither are there reasons for a standstill. Regions and cities in Europe are already preparing their citizens to combat the growing impact of climate change and are putting in place measures for a clean energy transition. The building industry is more than ready to produce and further develop products and services for energy savings and healthy indoor comfort which are affordable for the building occupants. The European Energy legislative proposals are therefore more than welcome instruments to guide all stakeholders of all member states to move forward into the right direction. More technology, more knowledge, more networking at R+T Stuttgart, that is what the Leading World Trade Fair for roller shutters, doors/gates and solar shading systems, will display and offer to the business trade from 27th February till 3rd March 2018. For the third time ES-SO will have at R+T its experts’ and workshop meetings. This time the ES-SO workshop will be held on Thursday 1st March 2018 in the Atrium, Entrance East from 9:30 a.m. – 12:30 p.m. Professionals interested in shading news and tools for the industry and building professionals are very much welcome. A short overview of the program with some highlights is to be found below. Kick-off of the smart solar shading campaign : solar shading systems are produced to provide intelligently thermal and visual comfort for the building occupants. ES-SO will come up with a communication campaign connected to training trajectories related to the different chains of the business. ES-SDA, the unique European solar shading database with longer term objectives (https://es-so-database.com/): ES-SDA has been developed since 2016 by ES-SO. Its origin comes from the concern of EPB (Energy Performance Building) regulators and building professionals that performance data of suppliers demonstrating the benefits of their systems on energy efficiency may not always be reliable. ES-SO established the database participating in the European funded Qualicheck Project (http://qualicheck-platform.eu/). Today Dickson, Helioscreen, Parà and Sattler are the first shading manufacturers having their data published on ES-SDA and more companies are ready to follow. Shading becomes essential on solving overheating issues in low energy buildings and therefore building regulators will be more likely to recognize reliable data presented by ES-SDA. Architects/engineers using these data in building modelling will now be able to have an accurate calculation of the benefits of solar shading. ES-SDA will be connected to ESBO, a simulation tool for solar shading professionals, available on ES-SO’s website as from 2018. Scientific evidence on solar shading benefits: ITRS, the shading and shutter association in Germany presents a brandnew released report on the Hauser energy balance study quantifying the benefits of shading and shutters in terms of energy savings and CO2 reduction. Evidence figures will be given for Germany and for Europe. Industry’s latest news on technical knowledge: CEN/ISO Standards are being updated and improved taking into account the developments of the shading and shutter systems. 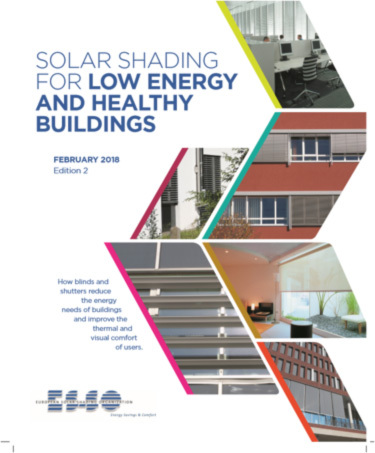 In its second edition of the “Solar Shading for low energy and healthy buildings” ES-SO Technical Handbook adds new chapters on daylight and updated Standards are included. Attendees who are registered will receive a hard copy at the workshop.